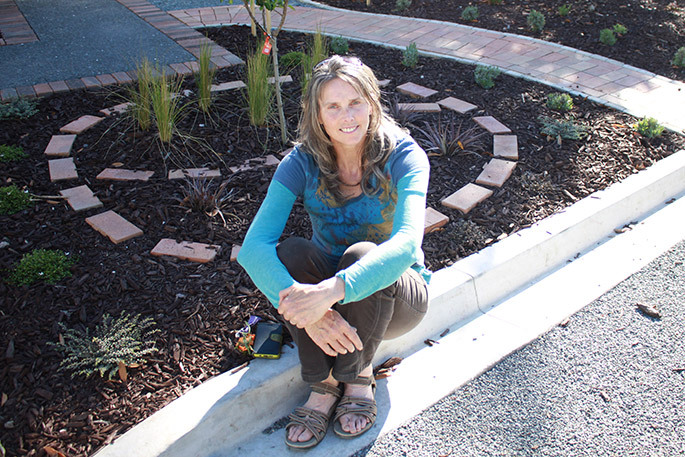 Toni McErlane in her concept garden at the Historic Village. They’re called concept gardens, and will live on well beyond the Bay of Plenty Garden and Art Festival later this month. Six local landscape designers/architects have created their individual concept gardens at Tauranga’s Historic Village for the festival. One of those, Toni McErlane, found inspiration in sustainability. Her garden features five separate beds, including a potager, a traditional ornamental vegetable or kitchen garden where flowers are planted with herbs and vegetables. It is made of recycled and permeable materials, forming pathways that link the gardens which have a focus on herbs and native plants that can be used for cooking or teas. They also work to create a habitat for insects, bees and birds, while leaving enough space to grow food. Toni says garden beauty and food is not possible without insects, birds, healthy soil and clean water, and all these have been considered in her planting and landscaping. Bee balm, echinacea and lavender will please the bees, while there are also strawberries, hazelnuts, Chilean guavas, blueberries, tamarillos, blackcurrants and red currants. There are dwarf varieties of nectarines, peaches, apples, pears, feijoas, lemons and limes, and native plants include hebes, grasses, astelias, kawakawa, and horopito. There are even roses for rose hip tea. The festival’s other concept gardens include a rain garden, a traditional garden, one featuring artwork created from reclaimed organic materials and a plot dedicated to Japanese kokodama.